In this work the artist draws blood form her body and adds to self portrait works by painting in blood on their surfaces and wraps the thus created drawings in plastic to ensure that no contamination can occur. The audience is then invited to view the drawings. 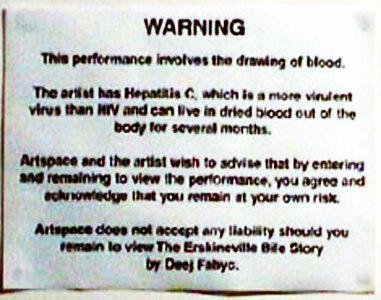 This work was almost banned from Artspace because of the potential blood spills issue and peoples fear of contagion; in effect, contagion is extremely unlikely for in order to contract Hepatitis C blood to blood contact is necessary, i.e. sharing toothbrushes, injecting equipment or sexual practices involving transfer of blood.